Rocketboom: pretty ladies and technology news. Awesome! 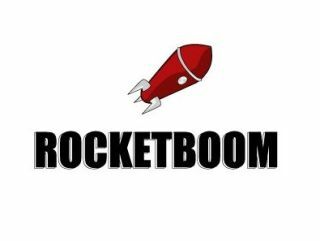 Rocketboom, the hugely successful internet technology news show, has signed up with Sony in a deal that will integrate the website into Sony's existing products. This means that the likes of the PlayStation 3 and Bravia TVs will play host to Rocketboom's news shows. In the new deal, Sony's online video site Crackle.com will merge with Rocketboom, with Crackle being the host site for the technology vodcast. The deal does mean, however, that Rocketboom will still be available through its regular channels, such as iTunes and TiVo. Sony will take care of advertising sales, while the deal itself is reputed to be in seven figures. Rocketboom creator Andrew Baron announced the deal on his blog, and this is what he had to say: "Instead of gaining capital to burn while continuing to build or seek an advertising solution, we now have one of the most prominent advertising solutions out there. "Along with increased distribution, a road map for expansion and a guarantee that I believe is an unprecedented deal for this space." Rocketboom has widely been seen as one of the first video blogs to hit the mainstream, with its original host Amanda Congdon leaving the show for a role at ABC News. This new deal should push the popularity of the site even further.